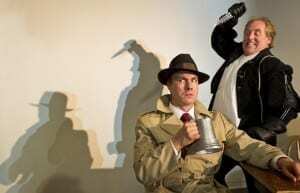 The 30th Edmonton International Fringe Theatre Festival is underway. It’s the longest-running theatre festival in North America and attracts an international audience. One of the major attractions this year is David Belke’s new noir comedy-thriller, Forsooth my Lovely. It’s a wonderful combination of Shakespeare and Dashiell Hamett, author of The Maltese Falcon, with its memorable protagonist, Sam Spade, a gumshoe in the mould of Philip Marlow, the hero of Raymond Chandler’s novels. The author is David Belke, who first came to the public’s attention twenty years ago with his play, The Maltese Bodkin, where a twentieth century private eye, the hard boiled Birnam Wood, operates in Shakespeare’s London. It’s decidedly postmodern in that this Chandler type protagonist, using the language of the noir novel, and still in his American detective novel persona, navigates his way through seventeenth century London. Birnam Wood is back. This time he’s investigating a blackmailing case in a plot that’s broadly based on The Taming of the Shrew. The combination of Elizabethan London and Chandler’s 1950s Los Angeles presents some very funny situations. In The Maltese Bodkin, for example,Wood, dressed in a three-piece suit, raincoat and fedora hat, goes into a tavern and chats up the barmaid in his New York English, while her replies are distinctly Elizabethan. The juxtaposioin is not only funny but also thought provoking. In Forsooth My Lovely Woods goes to Italy. As the play progresses you become aware of the similarities between The Taming of the Shrew and Chandler’s The Big Sleep. The two sisters Kate and Bianca, of the family Wood is investigating are paralleled with those in The Taming of the Shrew. It’s The Taming of the Shrew meets The Big Sleep. The play is full of characters from Shakespeare’s other plays and who are all beautifully interwoven into the plot. Imagine Humphery Bogart in his Dashiell Hamett role wandering through the maze of Shakespearean situations and characters. That’s Belke’s play. There is no end to Shakespeare, and if we could look into a world hundreds of years from now I believe we would still be seeing Shakespeare making his entrances in all sorts of ways.